It is established that the burial of Genghis Khan was always to remain a mystery. Warriors escorting the body fired arrows at any open windows en route and killed anyone they saw on the way to the burial ground. They then killed those who built the burial tomb, finally committing suicide themselves. Stories of the great treasure, said to be buried with him, have always circulated among Mongol tribes.The site of his former palace is located about 150 miles from today’s capital, Ulaan Bataar. Despite rumours and many searches (even, most recently, by satellite), nothing has ever been found. 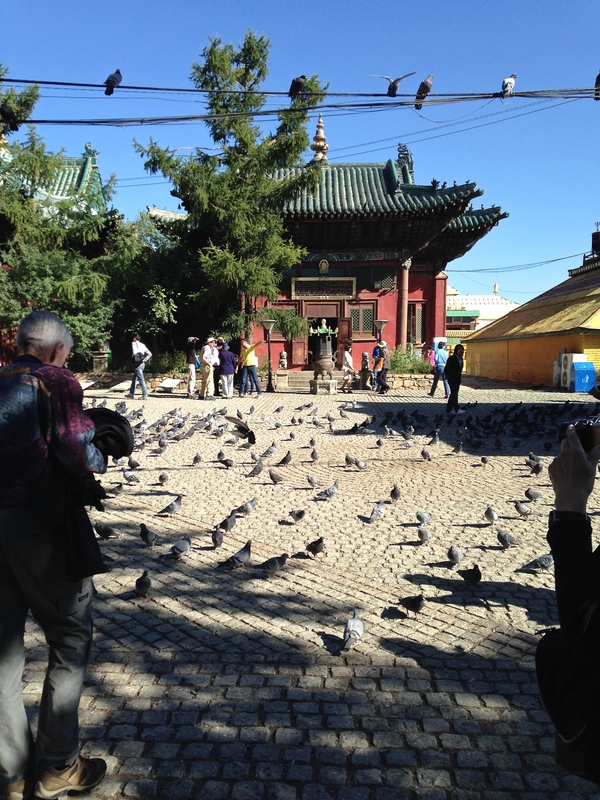 In the city itself, the main city square is dominated by the seated statue of Chingghis (Genghis) Khan on the approach to the National Museum. In fact, our first glimpse of “pleasure-domes”, from the Golden Eagle, was a traditional Ger-tent, a circular latticewood and sheep-felt structure, in this case adapted to a modern function.. a Burger King outlet ! We had passed the Russian border control at Naushki, all formalities handled expertly by Train Director Tatiana and the Golden Eagle team while we slept. Soon we reached Ulaan Bataar itself, located 1300 metres(4,300 ft) above sea level and the coldest capital on earth. We are told that new arrivals to the city, which contains almost half the total population of Mongolia ( 1.3 out of 2.9 million), mostly cope in their Ger tents sharing basic services and, in the harsh winter months, a highly polluted atmosphere from their wood burning stoves. Although overcrowded, according to a recent Financial Times report, the city still has some of the lowest crime rates in Asia. The modern skyline is dominated (since 2009) by a curved sail-like building known as the Blue Sky Tower. It has 25 floors and is over 100 meters high, with three bedroom apartments for sale at one million dollars each!! It also contains Louis Vuiton, Ermenegildo Zegna and Loro Piana boutiques as well as a 200-room luxury hotel. Ulaan Bataar is fully up to date! English is in use everyw here. A popular restaurant, DGH, is subtitled “Dreams Get Happiness” while another sign reads “DESTROY, Hair and Beauty Salon”?! The largest commercial enterprise is the STATE DEPARTMENT STORE, “All Needs are Fulfilled,100% cash back guarantee”. It is full of Western and UK brands that, according to our British fellow-travellers, are offered at 2/3 the price of Marks and Spencer. It is a long cry from the days when all modern ideas came from Russia, even when a Mongolian astronaut was sent into Space on Soyuz 39 (in 1981).Vodka also came from there and quickly became popular. It is now a major industry, together with the production of leather goods and, of course, cashmere. Mongolia is also a vibrant democracy. Near the National Museum, a large but simple black marble monument proclaims in Cyrillic, Mongolian and English) “NO TO DEATH PENALTY”. While two of our intrepid travellers, Bob and Geraldine, head out of the city to see the enormous (40 meters/about 130 ft tall) Genghis Khan statue by the Tuul river, the rest of us leave for the dramatic rocky Terelj National Park. The tour is led by our local guide Buyana, whose name, we find out, means “heavenly light”. It is a chance to catch a glimpse of wild Mongolia. An interesting traditional lunch is included (though not the grilled sheep’s head I hear is popular with the herders for breakfast). It is served at a spotlessly kept GER vacation motel. We also visit and examine a Ger tent where we are told that the two supporting posts represent a man and his wife (the word Ger itself means”home’), while a loose cord is always left hanging for prosperity. Doors must always be south-facing and the inner felt layers are increased from a single one in summer to 2-3 in winter. 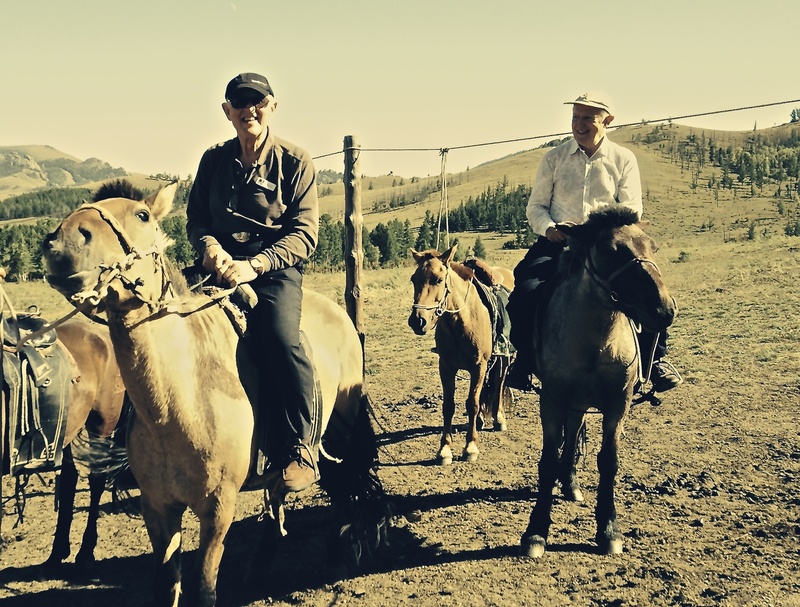 Fermented mares’ milk is offered to those seeking different flavours and tastes.The host family tell us how Mongolian boys ride a horse as soon as they can walk. We too explore the surroundings with a ride on those famoussturdy Mongolian horses, in a fabulous rocky setting, including a prominent rock resembling a huge turtle. On the way back to Ulaan Bataar we stop to watch Yak at pasture. The evening dinner is served on the 17th floor restaurant of the Central Tower building. Dishes are Mongolian-modern, the view is panoramic and the wi-fi is not connected for security reasons, as President Putin is coming for dinner next day, on his visit to discuss the oil situation.We are entertained by an amazingly flexible contortionist, then a traditional band demonstrating the unique, haunting throat singing. It is explained that male herders developed these strangely harmonic sounds in a landscape where echoes carry a great distance. It completes what has been an unforgettable day. So back to the Golden Eagle and a goodnight’s sleep in time to reach Sukhe Bator for the Mongolian passport checkat 6.45 am.